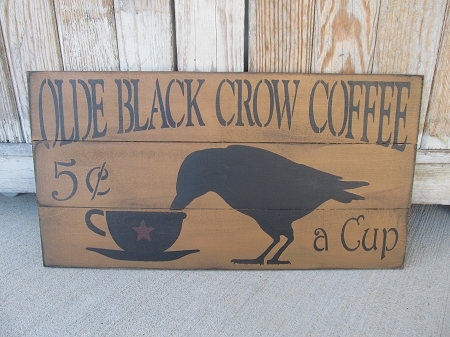 Primitive Olde Black Crow Coffee Hand Painted Pallet Sign with Color options. Hand stenciled Olde Black Crow Coffee 5 C a Cup Pallet Sign. I love painting on these new pallet signs. This one is perfect for your primitive kitchen or coffee nook. The background color shown is olde forge mustard that has been distressed with black showing through underneath and stained. Nice and primitive! The saying was stenciled on in black. I can also offer this pallet sign with a khaki tan colored background or dark taupe called Mississippi Mud. Choice of color scheme and hanging option. Size is 20" x 10". Hand painted, designed and signed by Heidi.